The other day, a friend asked me to share about my processes, techniques, and practices that support me staying actively sewing and making progress with my creative projects. She was experiencing a sense of overwhelm when she often had just 30 spare minutes, unable to decide how to make the best use of the time she had to create. I've been thinking about her dilemma ever since. I'll say up front that I have the freedom at this stage of my life to walk in the door after work and spend an hour sewing before I even think about what I might do about dinner. And weekends often allow for me to squeeze some sewing in around chores and errands and such. That all certainly helps. But personal timing aside, here's some things that I think help me walk right into the studio and pick up where I left off. Make your space inviting - Favorite mini quilts are hanging in my space, which encourage the spirit of creating. My pressing surface is covered in a bright cheerful fabric I love. And the basic tools I'll use are easily accessible. 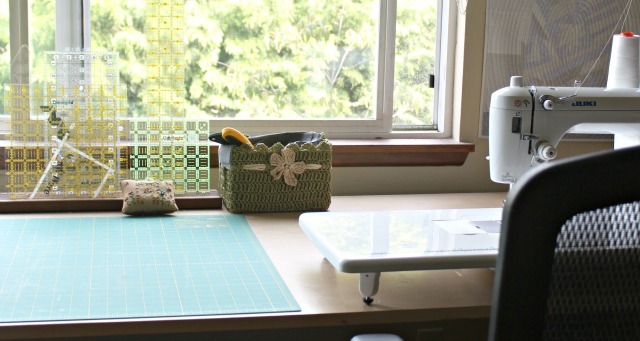 Tidy counts - I keep my space relatively uncluttered, as that's the way I work best. Also everything has a home, so I don't need to spend alot of time searching for what I need. Each session when I'm done, I take just a moment to slip my tools back in their assigned places, put away fabrics I won't be using, and toss scraps in their basket. Keep what you use on hand - If I run low on interfacing, a basic thread color, or machine needles, I replace as soon as possible, so the next time I need it, it's there waiting for me. Use a design wall - This isn't always possibility, but if it is, do it. Leave your current w.i.p. where you can see it and pick up where you left off. Just seeing it there will help draw you in, enticing you to get back at it. Don't ever think, "I don't have enough time." Maybe "I don't have all day," but see what you can squeeze in. 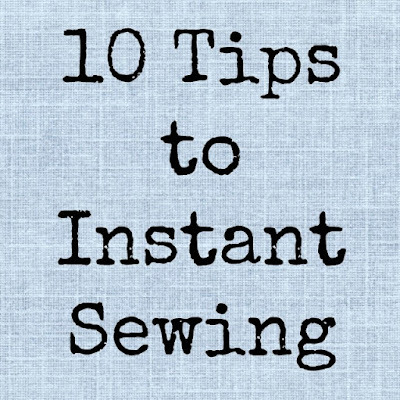 Even 10 minutes is enough time to trim a few more blocks, press a handful of seams, or gather some fabric from your stash so it's ready to go. Each step - every few minutes - is progress, and it really does add up. I've been known to do a sort of "trade-off"....do a chore, run and sew for a few minutes, do the next chore, back to the machine.... a bit hectic sometimes, but a way to balance what you need to do with what you want to do. Save something for t.v. time - In other words, whenever you have just a short time to sew, accomplish as much as you can in that time. Save the handwork, major seam-ripping, etc. for sitting on the couch or riding in the car. Ie. when you aren't near your machine and cutting table. Multi-task - Noone ever said you could only work on one project at a time, and I for one function better/accomplish more if I have several things in the works. So if I don't feel like basting a quilt, I may feel like piecing. 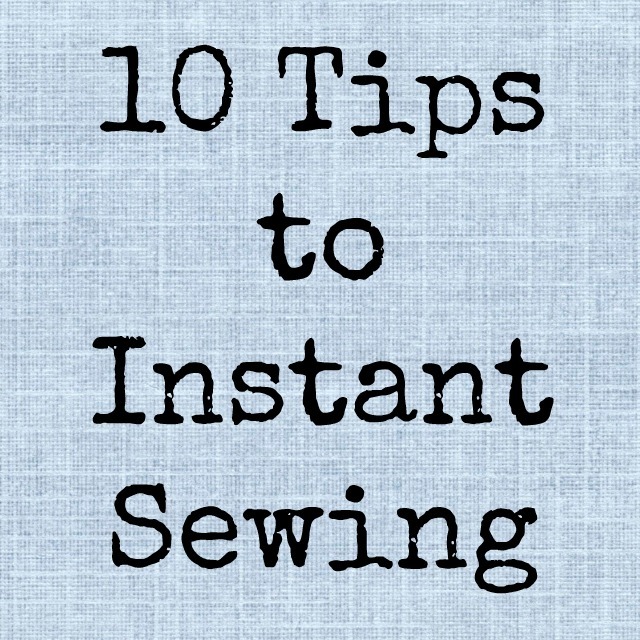 Or if it's too hot to press seams open, it might be a good time to pull fabrics. Save the hard stuff - What I mean is tackle more complicated details when you have time to really focus. You won't usually find me basting a quilt or installing bag hardware on a work night when my stamina may already be low. But that may be the first thing I attack on a weekend morning before the day's commitments begin, and yes, sometimes I even schedule it in on my personal calendar. Take time to play - Oh yeah. The best motivation I know is to ignore the list, set the w.i.p.s aside and do something that just popped into my head and I'm itching to try. That's exactly how the Postcard Quilt came to be. And A Step Towards Home. Yes, and most recently, Crosscut. That's some of my very favorite kind of sewing. Let's not forget to sometimes just do what we love. So that's what came to my mind right now. I (and my friend) would love to hear what works for you, so please feel free to share in the comments! A tidy space is really important for me, so I try to re-organize when I can to keep things clean and inviting for me. I know we all work differently, but that is very helpful for me to not feel overwhelm. I also recommend choosing a day (or two) to be internet free and to commit to going into the sewing room first. All very good tips Debbie! I also found that limiting my "online" time also helps to keep me productive. I try to read all the blogs I follow on Saturday and Sunday mornings while I sip my coffee. (I'm obviously breaking that rule right now! :-)). I used to spend much of my "free" sewing time online and that certainly doesn't help when you're trying to finish projects. Number 5 is key with two small children! I have my sewing machine in our living room and the elusive ten minutes when both girls are happy add up. I use the time spent stacking the dishwasher / cooking dinner / preparing a bottle to mentally plan what I'm going to tackle next time I get those 10 minutes! Even I'm amazed how much I can achieve. Great tips!! Lists and blogging definitely help me. I do like just mixing up my fabrics and seeing what inspires me! A tidy space is so important. I always have something cut and ready that literally requires just sewing. (3.5" squares for a donation quilt or have leftovers ready to turn into a potholder - great gifts) This allows me to play for the 10-15 random minutes I might have during the week. I agree -- keep something ready to work on while you watch tv or ride in the car. I played the multi-task game yesterday. One thing off of the household "have to" list and then 15 minutes of sewing; repeat. Basically when my space is a mess and I can't see my cutting table, I'm a mess. But if it's neat and clean and I have several things cut and ready to go (with varying levels of attention needed), then I'm productive and have a fun time. A few interesting ideas here. I haven't really thought about a list of what I'm working on, much less the various steps. My challenge is there is not currently a place that is mine for sewing, so it all gets put away for the next meal time. Boy do I make progress when hubby travels for work! awesome list! some things I would add..... keep a list where you can see it! I made myself a giant funky chalkboard that I update regularly & refer to constantly! Keep each project in a project box/basket so everything you need for that project is together & ready when you need it. I really appreciate this list! Right now, my sewing room is completely torn apart because I had to replace my water heater and the closet that it lives in just happens to be in my sewing room. Which meant: I had to move half my furniture to make way to get the old heater out and the new heater in (Plus the mess that that involves.) After doing that I have been exhausted so haven't put the room back together yet, plus I am going to put it back together so it makes more sense. Thank you for taking the time to give us all a hand!!! I am going to put your tips to use!!! There's great wisdom in your list, Debbie! I try to squeeze in as much time as possible, even putting something in the oven for dinner and then running to grab a few minutes stitching while it cooks. The struggle for more sewing time is real! Thanks for sharing these tips. I don't have space for a dedicated sewing room so I have to keep my projects and supplies gathered into containers that can be moved easily. Having all the little things in one container really helps. I also use scraps of time, say 10 minutes can be used to pick out fabric for a backing. I often think I will just do this one little thing and then when I do have time later it is waiting for me. Small tasks really do add up. I always love sewing and never do anything that's a chore. Also, the Finish Along is really motivating! Even if I only get one thing done it's a success. Great tips and ideas! Having a clean and organized work space works for me. I always have my lint roller handy to clean up the fabric fuss, threads and other little bits from my cutting mat and ironing board. There is no doubt that a quick and easy project is very rewarding, so I try and throw a couple of those in once in a while. I always enjoy hearing about the process others use to be productive, and you certainly are both a productive and creative quilter. Like you, I keep my studio tidy so I know where things are. My biggest issue is the computer. Right now I could/should be prepping for a workshop but I'm online instead. Definitely need to manage that. Thank you so much, Debbie, for these tips. I think that brought me back on track after being stuck with my projects. I can't work on too many projects though, I have to have the feeling of accomplishment and little organised steps on the way help a lot. Because sewing time is so precious. Those are great tips! What helps me most is having an organized sewing space. If it's too messy my mood probably is, too - so keep it clean and I feel more like doing the stuff I was inspired or motivated to do. It's organized and so speaks to my personality. I see what's in them easily and even if I meet with friends for a sewing day it's easy - grab them and your good to go. Love all those tips! I need to limit my blog reading to a specific day/time as well. I spend hours jumping from one link to another only to start following that one!! I have a question re your scraps. Do you 'organize' them -- that is cut them to specific sizes for use later? EX: 2.5" strips or square up pieces? What do you find as most efficient use of your time regarding scraps? I love the IDEA of a tidy workspace, but my creative process seems to create messes. I, too, work on several things at a time. I have different piles for different projects, each requiring different next steps. I choose what to work on depending on how much time I have. I enjoyed reading your advice!